Green growth holds the promise that solving environmental problems can at the same time create economic benefits. Yet, until now there is little analytically sound work on the possibility of such a dynamics. In this paper, we investigate conditions under which a transition from brown growth to green growth can improve the economic situation, both in the present and in the future. In our model, we combine three well-documented phenomena: the fact that a major aspect of technical change is learning by doing, the fact that learning by doing can develop in different directions, and the indeterminacy of labour markets resulting from the difficulty of matching the skills of people with the tasks arising in firms. 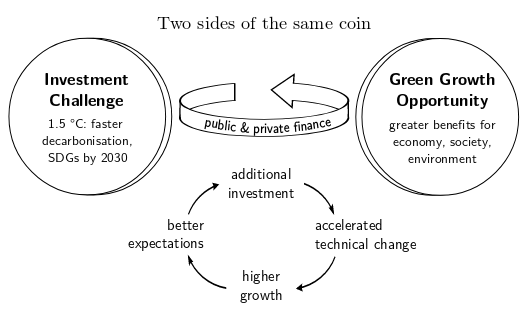 The combination provides new insights for the discussion about the possibilities of green growth. GCF presented work on the diffusion of electric mobility in a green growth context at the Electric Vehicle Symposium in Stuttgart in October 2017. This working paper is a follow-up version of the paper prepared for this conference.